This newly released 250 page soft cover book. Details the swords of this period. This is a must have volume for any collector. Includes the Military collection. The book is about a written history of the Smiths who made the swords for the monks of the local monasteries primarily around Hakata Bay where the Mongol armies of Kublai Khan made the attempt to invade Japan and the little known and interesting facts surrounding thier failure and the part played by the swords of the Kongobyoe. 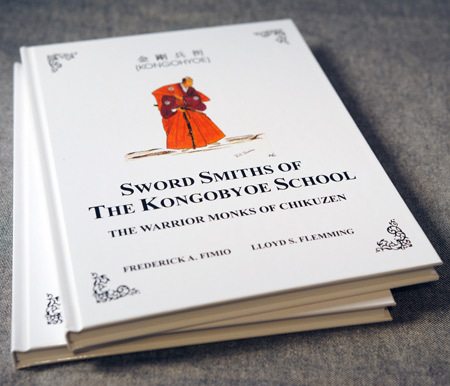 Swords-Smiths of the Kongobyoe School is by far the most comprehensive book published to date on one of the more interesting and overlooked schools of Nihonto. This book contains some never before seen information, compiled and researched from every known reference on the subject. A valuable aid to the Kantei and appreciation of Kongobyoe swords and featuring many color illustrations, this book also provides insight into the relevance of the Mongol invasions on the development of the Japanese Sword. 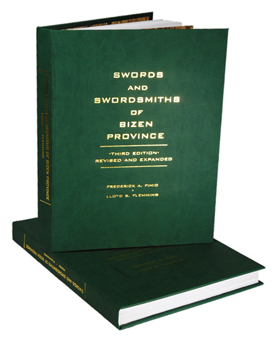 This impeccable new addition for the sword collector, written by Fred Fimio on the smiths of Hizen Province is a scholarly work worthy of the most fastidious collector. Over 200 pages, including 185 pages of full colour, high quality photographs and illustrations showing the fine detail of the swords and fittings. This book covers the full range of all six Hizento groups and every sword in the collection is personally examined and critiqued with full description and explanation. Each sword in the collection has documented. It has been designed to lay flat for ease of reading and study, thus easier for comparisons with blade in hand and for use as a research vehicle or travel hand-book. For the student and Japanese sword collector in search of authoritative first hand knowledge, identification, individual description and idiosyncrasies of the representative smiths in each period, the Japanese English edition of the Token Bijutsu (The Journal of the Japanese Sword Museum Tokyo, Japan) The 59 volumes were originally published in English for use by the western collector to assist us in the understanding and development of the sword, it has since more or less become the sword bible. Total 507 pages of photos and facts. In 1994 an almost fatal blow was delivered not only to the then almost 100 members of the European branch of the NBTHK, but to all sword-interested people in the non-Japanese world -- the cessation of the English edition of Token Bijutsu after 15 years. The reasons for this were rather easy to understand: the number of members worldwide decreased, the costs were increasing, the storage rooms in the Sword Museum were stacked with unsold editions, the interpreter had given up her job -- what should the management do other than to stop the publication. One of the most decisive points in this decision was, that everyone outside of Japan after 15 years should now have enough material in the English language on swords to be able to get along, and that was and is very true indeed. Otherwise I would not be in the position to write this introduction, because there is enough worldwide material to be published in the English Edition of Token Bijutsu, as this book by Fred Fimio proves, because it contains all the running articles on Shinto and Koto, written by the foremost authorities in Japan -- in appropriate English language -- and is as useful as it ever was, but because it was a running series, it eclipsed out of our minds, although it contains among the best and most important information about swords ever written in English. But it really was a harsh blow to the sword world outside of Japan, and the membership numbers dropped drastically -- I remember very well, that only a handful of members wanted to remain as the inner core of the European Branch, and a German group of sword students decided to be independent, but we, Hans-Joachim Eschbaum and me, kept the Branch going on. Why? Because the information provided in the Japanese Token Bijutsu is by far the best you can read on the sword, and giving up our status as a branch of the NBTHK would have meant to be shut out from the very best source of sword knowledge, a knowledge which enabled me, for example, to get into a deeper understanding of the Japanese sword, which admittedly is not an easy task. It took quite awhile for me to understand the sword, because I came from the "weapon side," everything which made noise and smoke was my world, not at all edged weapons. But at the age of 17 I saw my first Japanese sword and was from that very moment onward enthusiastically taken away by the beauty of this wonderful weapon, and when I had the means I bought my first sword on credit, a major blow to my bank account. It never recovered from this letting of blood, because I have not stopped collecting swords. Very quickly I had a rather large collection of swords, pole arms, armour etc., bought books, read them in the usual way, that means omitting everything in those books which dealt with art -- but then in 1972, I met an American (Bruce Kirkpatrick) who tried very hard to convince me of the fact, that these swords are art as well. It was a long way to go, but finally I sold almost all of my Japanese weapons and started to collect Japanese art, of which swords are the most important part. It took time to learn that swords were made not only for the warrior, but for the art lover as well, and that special polishing techniques were developed as early as the Heian era to show the beautiful effects of the metallurgical features in the steel and the hardening. As early as the Kamakura time, swords were considered as art. There exists a book, most probably from the Showa era (not from the 20th Century, of course, but from 1312-1317), which deals with the appraising of swords as art, and from Muromachi onwards there are many books on art swords. But those facts escaped my mind until I went to Japan for my first time, where I had the opportunity to handle swords -- real art swords -- at the annual meeting of the NBTHK. At once I became a member, and from that very moment onward I had the advantage of being able to look at swords of major importance, which in previous times only Daimyo and the Shogun were allowed to appreciate. But the art of the sword is a very demanding art, this special form of high art does not only need devotion and love, it is also to be appreciated if one has knowledge and trained eyes. This knowledge is acquired through the reading about swords, and the best source is Token Bijitsu. And the eyes are trained through looking at the very best art swords one is able to see, because only outstanding swords give you the chance to see everything you have read about. Of course, in lesser swords one finds metallurgical features as well, but they never are given in that stunning natural way in its entity like in real art swords. It is very difficult indeed, to interpret this and other art be it applied to art or sculpture, Japanese or from other countries, either in reading or writing books, because a book is only able to explain the technical end or to give a superficial glimpse on the historical or biographical details. For the true appreciation of art it is necessary to look at those works of art with ones own eyes "in natural" and in the same time to hear the explanations given by experts on the spot. I only hope, that this book will be accepted as a practical guide for the study of the Japanese sword instead of being a useful guide to buy swords. As I already stated, the reader should try to use every chance to study swords on the object itself than depend on merely "paper knowledge." In every case, we all owe Fred Fimio a hearty vote of thanks, that he was so kind to bring again very important knowledge to our eyes. It is my great pleasure to write a few words to congratulate the publication of this useful source of information which Mr. Fimio is generously sharing with fellow sword students outside Japan. It has been a long time since the publication of the English edition Token Bijutsu ended, but we at the NBTHK are very pleased to be aware that various efforts to make use of the teaching materials we selected for the journal are being made by different groups and individuals in many parts of the world to promote and deepen knowledge and understanding of the difficult subject of Nippon-to. Mr. Fimio's accomplishment will certainly contribute largely to the spreading of knowledge being earnestly pursued by many overseas sword students and will be most highly appreciated. Those of us who have collected Japanese swords for some years are struck by numerous changes that have occurred in the field, not the least remarkable being the comparative increased appreciation for gendaito. The appreciation has been two-fold; first, the new and deserved recognition of the fine quality of such outstanding smiths as Watanabe Kanenaga, Yoshihara Kuniiye, Tsukamato Okimasa, Kasama Shigetsugu, Miyaguchi Toshihiro and others Â– one of whom may well be the first gendaito Juyo Token designated in the not too distant future Â– and secondly, the real relative rise in the financial value of gendaito. 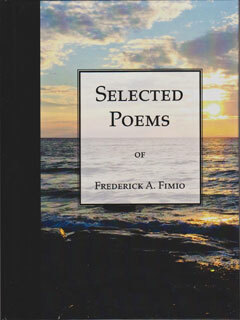 This new work by Fred Fimio joins a number of recent publications spurred by the interest in gendaito. With the exception of very early gendaito smiths, such as Gassan Sadakazu, Horii Taneyoshi, Miyamoto Kanenori, Sakurai Masatsugu, Rayama Enshin, Kasama Shinetsugu and Takahashi Sadatsugu, few are illustrated in the standard comprehensive books featuring oshigata. The foregoing omissions make this a useful reference volume. In addition to numerous oshigata, Fred has included a brief historical outline, some personal observations, character tables, a glossary, and index of 1500 gendai smiths, and, what I believe will be particularly helpful, a sort of rosetta stone for reading nakago inscriptions, or at least understanding the kind of information often found there. This book is a useful contribution to a rapidly growing literature. This is a must for anyone studying swords of the Bizen school. 1st and 2nd edition were sold out. The new and improved 3rd has been expanded to 300 pages. Over 100 Oshigata. major and minor Schools. High quality graphics. Exceptional quality hard cover. Cost: For advance orders, the price will remain at $150.00 U.S. plus shipping and handling $28.00 (U.S. & Canada) $80.00 (International). 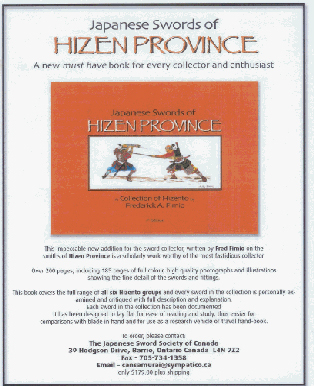 The Japanese Sword Society of Canada is pleased to announce the release of this new book, a joint work by Fred Fimio and Lloyd Flemming. Based on the original editions by Fred Fimio, this book has not only been completly revised, it ihad been improved and expanded to 300 pages with more swordsmiths described, more oshigata and the addition of Bizen sword kantei chapters. Many oshigata described in this book have not until now appeared in English language books, selected from Japanese texts as good examples of representative smiths. This was done so that they may serve as an addition to the samples found in other books. The most accurate genealogy and school lineage charts possible have been created for the various schools. A unique glossary with Japanese Kanji. To assist in the identification of Swords. This glossary is unique in that (1) it is divided into specific sections dealing with sword descriptions such as Boshi, Hada, etc. ; (2) it has an English translation with Japanese Kanji, and (3) it identifies the Smiths using a particular characteristic named in the glossary. Most collectors have experienced the frustration of trying to make sense out of the many smiths using the trade name Sukesada and hundreds more using the prefix Suke who belonged to the same family of Bizen smiths such as Sukehira, Sukemitsu, Sukenaga and Sukekane to name a few. Hundreds are listed. Scholars have narrowed it down to sixty mainline smiths and another twenty related smiths. Here we have programmed the sixty generations of the Sukesada family along with the related generations. This booklet is a welcome addition to every sword studentÂ’s research library to separate the production sword producers from the mainline art sword producers. Thank you Fred, for your book. It's like I've been given a piece of you. You're poems are sometimes heart searing, revealing what you are and what you have been, what you have suffered and what you are suffering, yet what you have won and achieved and continue to take delight and strength from. It expresses what many have been through and so few could talk about or understand. Thank you again. It's also a beautifully laid out and bound book. Each verse becomes a gift wrapped treasure. In general I think of poems as chocolates, you read one or two at least, not many more at a time and just let them sit with you until the next opportunity. The difference is that you can come back to the poems over and over again. That is what I have done with your book, had it lying around, near my bed or couch and taken it a bit at a time. I'm still going back and forth with the book, still enjoying it and not even sure whether I've read all the poems or not, but it doesn't matter because some are different each time I look at them. Thanks again for an unusual, enjoyable and thought provoking gift from your heart and mind. Title: "Art and the Sword"
An Eight Volume (Volumes 5&6 are together in one book) set of the Journal of the Japanese Sword Society of the United States, devoted to the study and appreciation of the Japanese Sword and its related subjects. Approximately 900 pages, soft cover, Volume 1 -- 8 x 10, Volumes 2 through 8, 7 x 9. Title: "Sue-Koto: Japanese Swords of the 15th and 16th Centuries"
This is a 692 page, Spiral bound, Two-Volume Set written by Yoshikawa Köen and others, it covers all schools of the Sue-Koto period. It was translated and compiled by, The Japanese Sword Society of the United States and with contributions from Gordon Robson. I highly recommend this important information. This full color illustrated, 141 page, soft cover book was written by Yoshikawa Köen, permanent Executive Director of the Nihon Token Hozon Kai.